A dressage rider who beat meningitis to compete at the highest level has been named one of the winner’s of the annual FEI Awards. Brazilian rider Rodolpho Riskalla based in France in 2015 when he was training for the Rio Olympic Games. He returned to Brazil to visit his ill father, when he contracted the meningococcal form of the deadly disease. 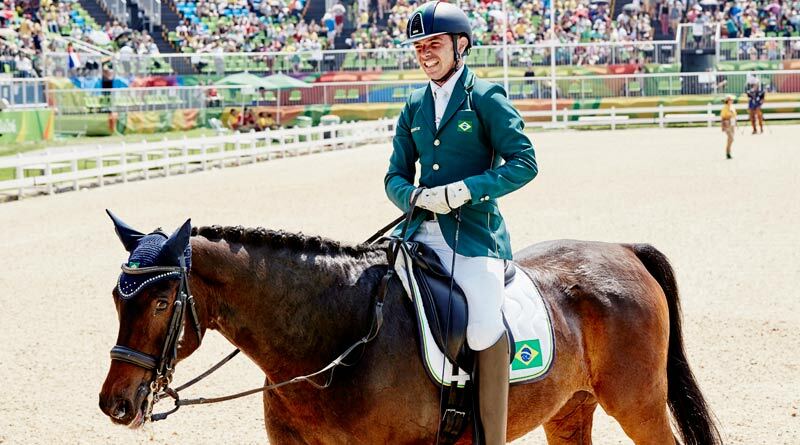 The disease resulted in the loss of both his feet and most of his fingers, but barely out of hospital following life-saving amputations, he was back in the saddle with his sights set firmly on the Paralympic Games, with less than a year to achieve his new goal. Riskalla, 31, had to learn how to ride again using prosthetic legs and few fingers, and his determination, passion, resilience and dedication have made him a national hero. Riskalla pursued his dream of representing his country at his home Games despite what life threw at him and had to work tremendously hard to overcome adversity. Rodolpho Riskalla during rehabilitation after his legs were amputated. He was named the winner of the FEI’s Against All Odds award at the gala dinner in Tokyo, Japan, on Tuesday night following the FEI’s General Assembly in the presence of guest of honour, FEI Honorary President Princess Haya. “To win the FEI Awards, it’s like the Oscars, it’s like being a superstar,” Riskalla said. Hosted by joint Master of Ceremonies Liz Price and the Athens 2004 Olympic hammer champion Koji Murofushi, now Sports Director for Tokyo 2020, the FEI Awards gala ceremony was watched by more than 300 distinguished guests, National Federation representatives, FEI partners, VIPs and international media. FEI Against All Odds Award winner Rodolpho Riskalla at the awards ceremony in Tokyo. The five categories in the FEI Awards 2016 attracted a record number of nominations from the public, giving the judging panel an extremely hard task to select the final winners. Chaired by Japanese Olympic Committee President and FEI Honorary Vice-President Tsunekazu Takeda, the judging panel also included the FEI President Ingmar de Vos, Longines Vice-President Juan-Carlos Capelli, last year’s best athlete Boyd Exell, President of the Swaziland National Federation Glenda Warburton, FEI Awards Against All Odds winner in 2010 Angelika Trabert and British television presenter Liz Price. The evening’s celebrations had opened with a presentation made by Juan-Carlos Capelli to De Vos of a limited series timepiece from the Longines equestrian collection, the Longines Equestrian Pocket Watch Horses Trio 1911. This special presentation was made on behalf of the Swiss watchmaker to celebrate their 105-year commitment to the discipline of Jumping. The exclusive 18 carat rose gold timepiece will be permanently showcased in the state-of-the-art interactive gallery at FEI Headquarters in Lausanne. Other winners at the awards included Rio 2016 Olympic Jumping champion Nick Skelton, who was named Best Athlete, and his groom, Mark Beever, was won the Best Groom award. Germany’s Sönke Rothenberger won the Longines Rising Star award and was also presented with a Longines Conquest Classic watch; while the FEI Solidarity award went to the Morocco National Federation/SA Charif Moulay Abdellah Alaoui, President of the Royal Moroccan Federation for Equestrian Sports. This award was accepted on behalf of the Federation by the Moroccan Secretary General, Badr Fakir.